The most alarming forecasts of natural systems amplifying the human-induced greenhouse effect may be too high, according to a new report. The study in Nature confirms that as the planet warms, oceans and forests will absorb proportionally less CO2. It says this will increase the effects of man-made warming - but much less than recent research has suggested. Further, they say their concern about man-made climate change remains high. The research, from a team of scientists in Switzerland and Germany, attempts to settle one of the great debates in climate science about exactly how the Earth's natural carbon cycle will exacerbate any man-made warming. Some climate sceptics have argued that a warmer world will increase the land available for vegetation, which will in turn absorb CO2 and temper further warming. This is known as a negative feedback loop - the Earth acting to keep itself in balance. But the Nature research concludes that any negative feedback will be swamped by positive feedback in which extra CO2 is released from the oceans and from already-forested areas. The oceans are the world's great store of CO2, but the warmer they become, the less CO2 they can absorb. And forests dried out by increased temperatures tend to decay and release CO2 from their trees and soils. that would limit the amplitude of future climate change". The IPCC's fourth assessment report had a broad range of estimates as to how far natural systems would contribute to a spiral of warming. The Nature paper narrows that range to the lower end of previous estimates. The report's lead author, David Frank from the Swiss Federal Institute for Forest, Snow and Landscape Research, told BBC News that many of the calculations for the IPCC assessment report did not include an integrated carbon cycle. He said that if the results his paper were widely accepted, the overall effect on climate projections would be neutral. "It might lead to a downward mean revision of those (climate) models which already include the carbon cycle, but an upward revision in those which do not include the carbon cycle. "That'll probably even itself out to signify no real change in the temperature projections overall," he said. The team's calculations are based on a probabilistic analysis of climate variation between the years 1050 and 1800 - that is, before the Industrial Revolution introduced fossil carbon into the atmosphere. 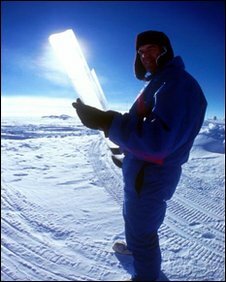 Using 200,000 data points, the study - believed by Nature to be the most comprehensive of its kind so far - compared the Antarctic ice core record of trapped CO2 bubbles with so-called proxy data like tree rings, which are used to estimate temperature changes. The most likely value among their estimates suggests that for every degree Celsius of warming, natural ecosystems tend to release an extra 7.7 parts per million of CO2 to the atmosphere (the full range of their estimate was between 1.7 and 21.4 parts per million). This stands in sharp contrast to the recent estimates of positive feedback models, which suggest a release of 40 parts per million per degree; the team say with 95% certainty that value is an overestimate. "This is a valuable paper that helps to constrain certain feedback components for the past," said John Schellnhuber, director of the Potsdam Institute for Climate Impact Research. "However, it is probably not suited for extrapolation into the future and it does not cover the really interesting processes like anthropogenic activation of permafrost carbon or methane clathrates." The paper will surely not be the last word in this difficult area of research, with multiple uncertainties over data sources. 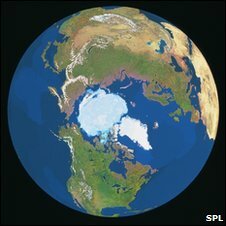 "I think that the magnitude of the warming amplification given by the carbon cycle is a live issue that will not suddenly be sorted by another paper trying to fit to palaeo-data," Professor Brian Hoskins, a climate expert from Imperial College London, told BBC News. Another crucial issue is the degree to which past trends will line up with potentially very different future scenarios. Professor Tim Lenton from the University of East Anglia said: "It looks intriguing and comforting if they are right. The immediate problem I can see is that past variations in CO2 and temperature over the last millennium were very small, and this group are assuming that the relationship they derive from these very small variations can be extrapolated to the much larger variations in temperature we expect this century. "We have plenty of reason to believe that the shape of the relationship may change (be nonlinear) when we 'hit the system harder'. So, I don't think they can rule out that the positive feedback from the carbon cycle could become stronger in a significantly warmer climate."